will take you to the page. I've also added it to the links list on the right. One of the first patterns in the book is one I like to use for teaching and it's pictured here on the right. The design is intended to be worked in size 10 variegated thread. I created this pattern so that it could be done using all chains an using a variegated thread it works the same way as using 2 colours of thread since you rarely have the same patch of colour both wrapped over your hand and coming from the shuttle. 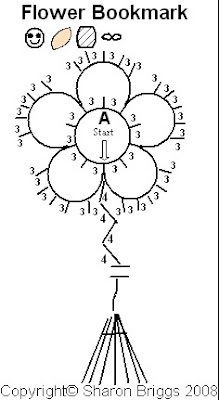 The central ring can be tatted as a ring or it can be tatted as a mock ring so that the whole bookmark is done in chains. I often cut out flat shuttle shapes out of card stock or plastic lids and prewind them with thread. For the "ball" thread I use my business card and wind the ball thread around it, holding the card and the shuttle together with a paper clip and that way everyone is starting at the same point. The paper clip is slid over the thread between the shuttle and the card and we can start with the mock ring in the centre. I explain the difference between a normal and a mock ring and show them how they are different, but I use chains in the first lesson and rings on the second lesson. The tail of this bookmark is just a zigzag chain with a tassel. It's a simple enough project that beginners will be able to complete it easily. It gives them practice without adding in anything confusing so they can concentrate on getting the thread to flip and making their picots a uniform size. There are several small bookmarks like this at the beginning of the book that use different techniques and let beginners learn things step by step. 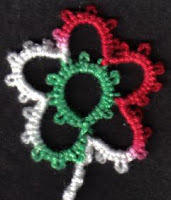 If you are a tatting teacher looking for a simple pattern to work with, you have my permission to copy and distribute this pattern and picture. Thank you Sharon, I haven't taught in a while, but if the occasion arises I'll keep this in mind. Very good simple pattern.